Here we are, a month after the fact, and I still haven't quite processed that there is this little human, given to us by God, to keep and love and raise as long as He wills it. Granted, a LOT has happened since his birth (not the least of which being that Kevin had major emergency surgery when AMG was one week old), but I'd like to get this story written down. In my humble opinion, the birth was AWESOME. I've long been a natural birth junkie. It makes sense, given how I live the rest of my life, but the desire for a wonderful birth experience has only intensified with the period of infertility. Was it what I expected it to be? Not at all. But it was beautiful, nonetheless. And I'm super grateful. Once I hit 38 weeks, I was ready to go (both physically & emotionally). I mistakenly thought this baby would come early, but I was so wrong. I'd have super minor cramping most days and I'd get all excited, but nothing really happened until the morning of Monday, November 20th (40 weeks + 5 days according to the doctor's dating, 40 weeks + 1 day according to my NFP charting). I woke up with some period-like cramping around 5am and moved out to the living room. When I say "period-like," I should say that my periods are far worse than the average person. I had been told by my OB (who also performed my laparoscopy the year prior) that much of labor might resemble a bad period for me - at least, that's what he's told by his patients with a history of endometriosis. He was super right. And praise God! I've had YEARS of learning to cope with that type of pain, so to be honest, most of Monday was pretty chill. I was scheduled for an appointment at the clinic later that day to start the overdue protocol (biophysical profile ultrasound + some time on the NST machine). During the ultrasound, I was super uncomfortable (who wants to lay on their back and not move at ANY point in late pregnancy, even without the cramping?!). It was while hooked up to the NST machine, though, that the staff realized I was actually in labor. The PA (my OB was at the hospital finishing up in surgery), showed my results to another doctor in the practice, came back in and said, "you're having MASSIVE contractions, you need to go to the hospital asap." So I went out, told Kevin, and we both were kinda like, "well, I guess it's time?" So we made our way towards the hospital and I let our doula, Emily, know. We got there about 3:45pm, dealt with triage, and went to our room. Honestly, both Kevin and I sat there slightly confused. I said to him, "I feel like an impostor. We shouldn't be here." Emily arrived around 4:30pm and I was hooked up to the fetal monitoring machine, 2-3 cm dilated, 90% effaced, with a bulging bag of waters. We just kind of talked casually, discussed the pain/pressure I was feeling. Around 5pm, I hopped onto the birthing ball. I stood up to re-adjust and BOOM. Real labor began. Everything changed instantly. So much pain. Such pressure. Could hardly stand. I got into the shower and began vomiting. Amidst all of this new intensity, though, was such a great calmness. I was fairly silent, Kevin and Emily were praying over me, and things progressed. I recall at one point them both singing "Jesus, I adore you" and it flooded my soul with peace. The pain got worse and worse and I honestly couldn't believe the shift that had happened so quickly. I transitioned to hands and knees position on the bed, and began deep moaning through contractions (the ONLY coping mechanism that seemed to help me in labor). Again, super intense but Kevin and Emily were rockstars at keeping me focused. It was a very intentional experience with great direction from my small team. And lots of "Jesus, Mary, and Joseph" mumbling under my breath. And we can't forget...Coldplay. We had them on spotify and they played continuously in the background and it was awesome. At 7pm, about 2 hours after the intense labor began, I requested a cervical check. I had said to Emily, "if I have not progressed I am getting an epidural." In my head and heart, I knew that wasn't true, but I just really couldn't imagine this much intensity for several more hours. So the lovely nurse checked and I could hear her and my doula whispering something about "good news." Apparently I was now at a 9.5 with no more bag of waters (must have broken in the shower). I was praising the good Lord since I was definitely feeling the urge to push at this point. At some point, I began to get some relief and pause in between "practice pushing" contractions. Somewhere around 8:30-8:45pm, I began pushing (doc had entered the room! I didn't even see him, I was hands and knees on the bed totally in the zone). Since André ended up being a bit of a larger baby, especially considering my size and the fact that he's my first live birth, it took a bit to get this boy's head out. But once that was out, the rest came instantaneously! 9 pounds 8 ounces! Everyone was shocked. I pushed for about 40 minutes and he was born at 9:22pm. When the doc slid him underneath so I could see him, I was in a weird state. It was less of an emotional high and rush of loving feelings as it was, "who the heck is this and how did he come out of me?" That's normal, right? Now, the real tragedy is that none of us recalls which Coldplay song he was born to. We all remember the perfect ones that played during the pushing phase (Paradise, Charlie Brown, Message, Speed of Sound), but no clue which was played at the big moment. Oh well :). 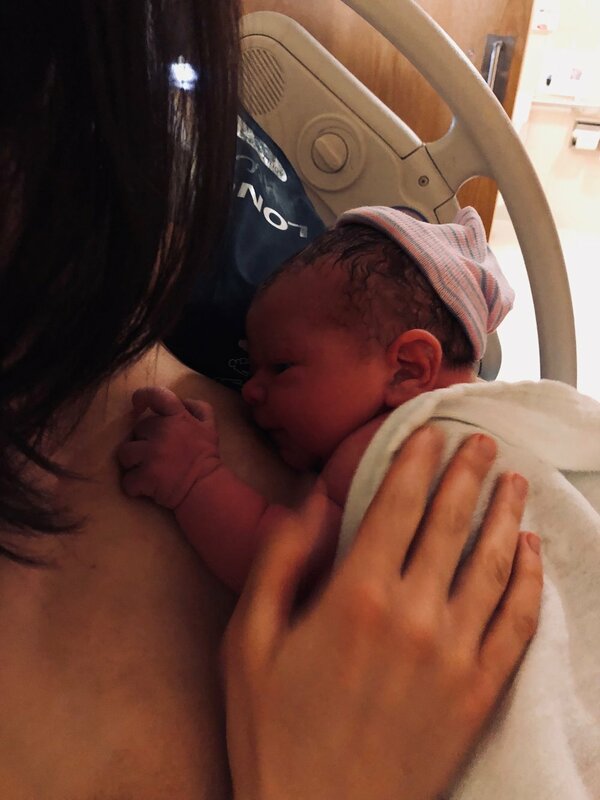 Anyway, we did all the standard "skin-to-skin", let him breastfeed type stuff while doc stitched me up (so.many.stitches), and allowed the utter craziness sink in a bit. We are so grateful to God for granting us a peaceful, healthy, and safe delivery. And I'm so, so thankful for Kevin and Emily - both were simply amazing to have by my side and I couldn't imagine it any other way. Now he's here and we're figuring this parenthood thing out day by day. It all comes down, though, to love. We love him and praise God for this gift.